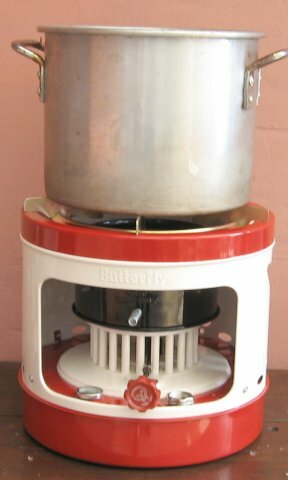 The Butterfly #2698 cook stove is perhaps the best stove available for heavy duty cooking, canning, boiling maple syrup, baking, etc, with 22 wicks producing 14,000 BTU/hr. At 12.5" high and 14" wide, this is a large stove! 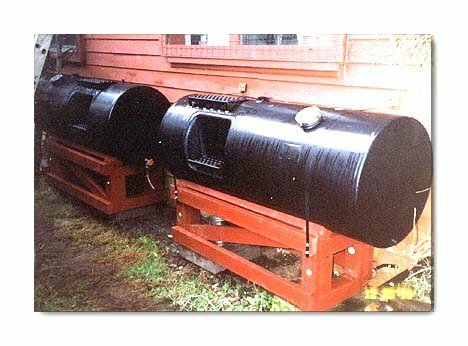 The #2698 has the strength to easily support a waterbath canner or pressure cooker, and makes the Alpaca stove look like a feeble toy by comparison. If you saw the less expensive Butterfly stoves sold during Y2K, this stove will amaze you - no sharp edges, nice paint job, truly a finished product. 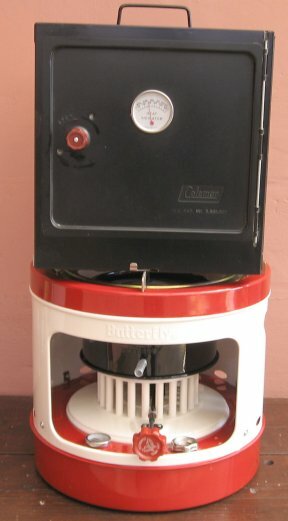 The Butterfly #2698 stove comes completely assembled except for installing the wicks. It is at this stage that the stove should be inspected and polished. Normal liquid auto polish should be applied to all surfaces, inside and out. All it takes in about 15 minutes, and the pores of the enamel are filled, the stove will not rust in storage, nor will spilled food cause any stains. You can prove to yourself how important polishing is to metal. Take two plain nails and apply a coat of polish to one of them. Put both nails on a fence post or other exposed location. Within days one nail will be horribly rusted while the polished nail is pristine. Make a hook on the end of a thin piece of wire as a wick installation tool. Fold each wick in half, slip the fold into the hook, and push the wire up from the bottom. Grab the wire and pull the wick up past the top about an inch. Repeat until all 22 wicks are installed - and too high. See the raised lips on each side of the wick? Those are the guides for trimming the wicks level. Turn the wick knob to raise the wicks to their highest position, then pull them back even in height with the raised guides. That is the last time you will have to pull the wicks down. From now on, if the wicks need trimming they are pulled up a quarter inch and trimmed level by laying a pair of sturdy scissors across the two guides. When the wicks are retracted they will disappear down into tubes. That is how the stove is shut off. The Butterfly #2698 is now ready for use. To light the #2698, remove the red top and the black catalytic converter, raise the wicks, light them, then replace the catalytic converter and top piece. Turn the wick knob to lower the flame height until the catalytic converter is, then adjust the flame height to obtain the heat output you need. Regulate the heat output as needed by raising or lowering the wicks. The photo above shows a 10" frying pan sitting securely on the sturdy racks. This is about the smallest pan for this stove. Other stoves, like the gravity flow models, can cook meals every day and are very easy to light and use without burning your dinner. The #2698 can be used as an every day stove as well, but for heavy duty cooking and canning this is the best stove I have ever used. Far left, the Butterfly #2698 heated 4 gallons of water in a 20 quart stock pot to boiling within 20 minutes. Near left, a crummy folding Coleman oven has been quickly heated to 300 degrees. Coleman ovens have no insulation, and in fact have huge gaps between the sides and the bottom and top plates. The Butterfly #2421 oven is insulated and vastly superior for actual use as an oven. NOTE: The Butterfly #2698 stove - as well as all other kerosene stoves - should be broken in by burning in a well ventilated area free from strong drafts. Let the stove burn for several hours. That will season the metal and burn off any protective oil on the catalytic converter. Then the stove will be ready for use indoors. Because the Butterfly #2698 produces 14,000 BTU/hr and has a fuel tank large enough for 12 to 18 hours of operation, it can be used for heating a greenhouse, for example. Just remember that the design of a stove is for the flame to impact something, so use the stove properly if used as a heater. When not in use, the Butterfly #2698 can be stored in the factory shipping box, ensuring that it is clean and dust free when needed. Be sure to store the stove "dry," empty of fuel, to avoid any condensation in the fuel tank. See Stove Maintenance and Storage. WARNING: Kerosene stoves were designed to burn kerosene. DO NOT attempt to burn gasoline in a kerosene stove! See Kerosene Fuel Primer for more information.